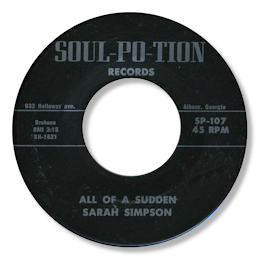 Jesse Boone’s lively little label Soul-Po-Tion from Albany, GA had some fine releases on it including 45s by Carolyn Champion and Milton Marlin, not to mention his own sides. But the two from Sarah Simpson can hold their own against any competition. The first one “I’ve Kicked The Habit” is really superior funk with a wonderfully sassy vocal from the lady - high grade confident phrasing and a hard tone. Great tenor sax solo in the middle too. Her second – and sadly last - single featured an equally classy deep ballad All Of A Sudden. This showed that Sarah could master an emotionally compelling ballad just as well as the dance genre. Check out those screams and the way she interjects little hummed “words” – and her passion on the chorus is totally convincing. Superior horns and organ/piano support. Tasty uptempo flip too. UPDATE ~ Grateful thanks to Garry Cape for the fine pic of Sarah.